The Lake Erie Monsters have announced the 2015-2016 Promotional Schedule which includes many exciting enhancements. In collaboration with their new NHL affiliate the Columbus Blue Jackets, the team will feature twelve (12) "Blue Jackets" Nights where the team will celebrate all things Blue Jackets, including specialty jerseys worn by Monsters players and Blue Jackets themed game night entertainment during every Friday night Monsters home game. Also new this season, the schedule will feature a new concessions promotion; "1-2-3 Fridays!" Every Friday night home game, fans can look forward to $1 Sodas, $2 Hotdogs and $3 Draft Beer Specials (select 12-14 ounce draft beers). EVERY WEEKDAY: College ID Night returns in 2015-16 including special $6 tickets with a valid college ID. There will be thirteen (13) Tuesday, Wednesday and Thursday night games this season. 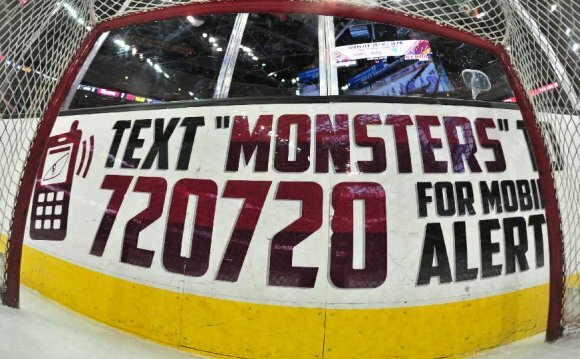 College students - take a break from the books and enjoy some weekday Monsters hockey at The Q! EVERY FRIDAY: Blue Jackets Night & '1-2-3 Fridays'. Fans can enjoy $1 Sodas, $2 Hotdogs and $3 Beers. Plus a free postgame open skate, presented by Hudec Dental. There are twelve (12) Friday night games this season. EVERY SATURDAY & SUNDAY MATINEE GAME: KIDS GAMES! Monster Kids Meals will be available where all kids can enjoy a hotdog, soda and chips for only $6. Also, the first 1, 000 kids to each of the Kids Games will receive a free day pass to everyone's favorite indoor waterpark, Castaway Bay! There are six (6) Kids Games. "Fans Choice Theme Night" (NEW!) - December 12th - Fans will be given the opportunity through social media to decide this theme and first specialty jersey night! Details will be released in the coming weeks on this exciting opportunity for Monsters fans. "Cleveland Cavaliers Night" (It's back!) - December 29th - the team will be wearing special Cavaliers themed jerseys and there will also be a Rally Towel giveaway for the first 10, 000 fans. "Cleveland (Hockey) Rocks Night" (NEW!) - February 20th - the Monsters will be 'throwing it back' in specialty jerseys that pay homage to Cleveland hockey history. "Lego Night" (NEW!) February 27th - The first 3, 500 kids 14 & under will receive a Monsters Player Blockhead Figurine. The Monsters will also be wearing specialty jerseys, with a portion of the jersey auction proceeds benefiting local autism research organizations. "Monsters Go Pink Night" (It's back!) - March 19th - players will be wearing the traditional pink in honor of breast cancer awareness with a twist! New this year fans will be able to submit names to be honored and included within the jersey design. Through the Monsters Community Fund, a portion of the proceeds from the jersey auction that night will go back to local breast cancer awareness organizations. Among the many free giveaways, the schedule will feature a Monsters & Blue Jackets Collectors Schedule Cup on Opening Night for the first 10, 000 fans. Other giveaways will include: a Monsters ski hat on December 26th, a Monsters Fathead Tradeable (Kids giveaway) on January 30th, a T-shirt on February 20th, a Monsters Player Blockhead Figurine (Kids giveaway) on February 29th, a Monsters Bobblehead on March 25th and a Players and Pups Poster on April 10th. All giveaways this season will be allotted to the first 10, 000 fans in the building! Kids giveaways will be for the first 3, 500 Kids 14 and under. Cleveland fans can also look forward to the return of popular annual promotional nights such as: "Salute the Troops Night" - November 14th, "Pucks & Paws" bring your dog to the game - April 10th and "Fan Salute Night" on April 15th. Single game tickets for the 2015-16 season will go on sale to the general public TODAY (Wednesday, September 2nd) at 12:00 p.m. A special presale for Monsters Hockey Club members will begin today at 11:00 a.m.